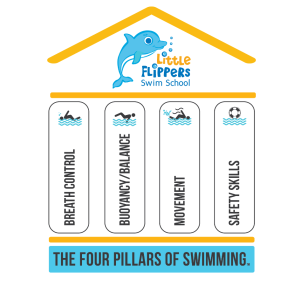 Little Flippers Swim School specializes in swimming instruction using The Four Pillars of Swimming™ progressive curriculum that emphasizes correct technique and general water safety. Developed using guidelines established by The United States Swim School Association, we use developmentally appropriate activities that enable children to build character, accept challenges, and develop confidence. We offer three different groupings of “The Four Pillars of SwimmingTM” Swim Lessons as well as Weekly Intensive Lessons. Choose the category that is best for you! INFANTS AND TODDLERS (ages 3 months to 3 years). PRESCHOOLERS AND KINDERGARTENERS (ages 3 to 5.9 years). SCHOOL AGE CHILDREN (ages 6 and older).